Teutonic Tuesday? Come at me bro! 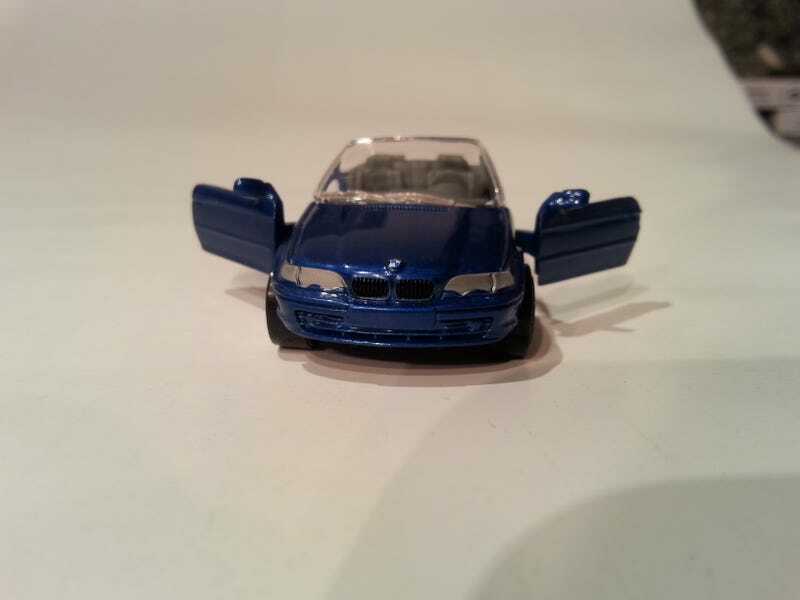 Matchbox E46 Convertible in blue with some details. It's what I want my customs to be, just that this one came straight out of the box. See the black kidneys? There's a reason why my BMW customs so far have all been black. Lamley readers will know about it anyway. The dash is sculpted quite nicely, and hoooray, a real steering wheel and not the steering disc we have to live with on so many Mattel model cars. The casting itself is totally spot on. All the lines are there, and the general shape of it is too. Why do they have to do all these "fantasy" cars when their actual models CAN be this perfect? It's not TLV-NEO perfect, but that's not something anyone was expecting. Let's take a look at the box. Sorry, it's empty! I am a Neanderthal, when it comes to cars. I just have to get them out ASAP. But can you see the Matchbox or the Mattel logo? Neither can I! Oh, there it is! Pretty discreet. The bottom says "licensed by BMW" and nothing about the actual manufacturer.